The styling of the Orion and Orion Plus are outstanding. The smooth body shape blends into the base Fiat Ducato front end to produce a vehicle that has a real wow factor. 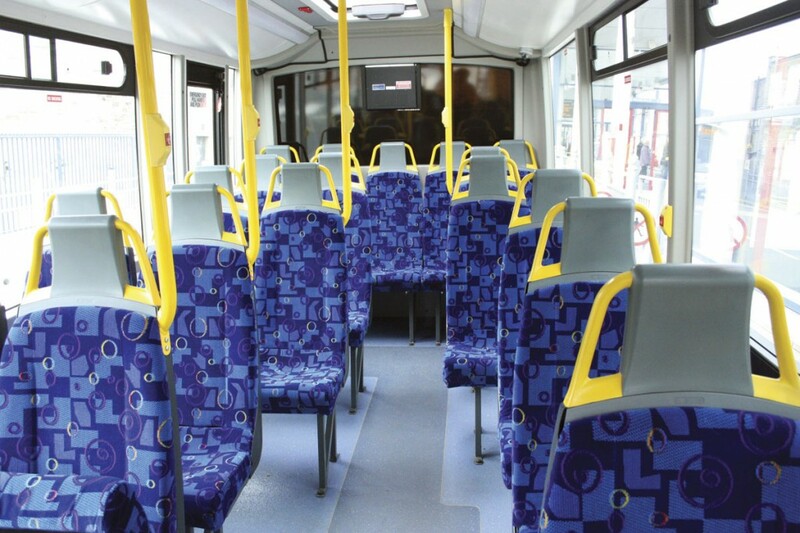 The announcement earlier this year that Bluebird Vehicles had gone into administration came as a surprise to many operators. Sadly not me. I knew that Bluebird Vehicles had been suffering for some time from a lack of forward orders brought on by the on-going economic situation, particularly the swingeing cuts to local authority budgets, the traditional source of much of Bluebird’s business. Bluebird’s narrow product range had left it vulnerable. 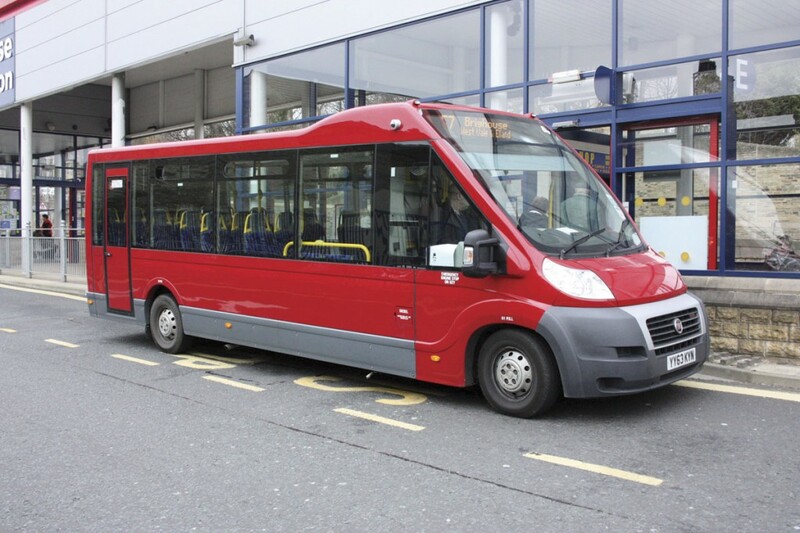 The final nail was the antics of Transport for London over its tender for new low floor, directly wheelchair accessible vehicles, for which Bluebird has been main supplier and was again the main contender. This tender had been around for some time and companies like Bluebird had been forced to spend considerable amounts of money and time in responding to the ever changing requirements, only for TfL to suddenly cancel it, without warning. I was immensely saddened by the News. I’ve been involved in recording through these pages the developments at Bluebird Vehicles ever since Rob Miller and Gary Robinson first took possession of the old Plaxton building in Scarborough and prior to that when they were involved with Rohill. I’ve always been impressed with the excellence of Bluebird’s design work, the engineering and the build quality. Someone else who recognised those qualities was Brain Davidson who got to know the team well when he was busy rescuing Plaxton. Few people know that much of the detail design work for Plaxton’s Centro bus that marked the brand’s re-entry in to the bus market in the days before it became part of ADL was actually done by Bluebird’s engineering team and in fact the prototype chassis was also built by them. When the announcement of the Bluebird administration was announced, Brian was quick to move in and secure the intellectual property rights and assets of Bluebird for the rejuvenated Woodall Nicholson operation, which includes long established accessible vehicle builders, Mellor Coachcraft. Brian and his team had acquired Woodall Nicholson Ltd in 2013 and had already introduced major changes throughout the organisation. In many ways it was the perfect marriage. Woodall Nicholson with its diverse range of products – hearses and limousines (Coleman Milne); specialist blue light vehicles (CM Specialist Vehicles), van conversion and coachbuilt minibuses (Mellor Coachcraft) – had the product base stability that Bluebird lacked. As has been demonstrated through the recession, that broad base can provide the cushion to carry the Group forward during difficult times. 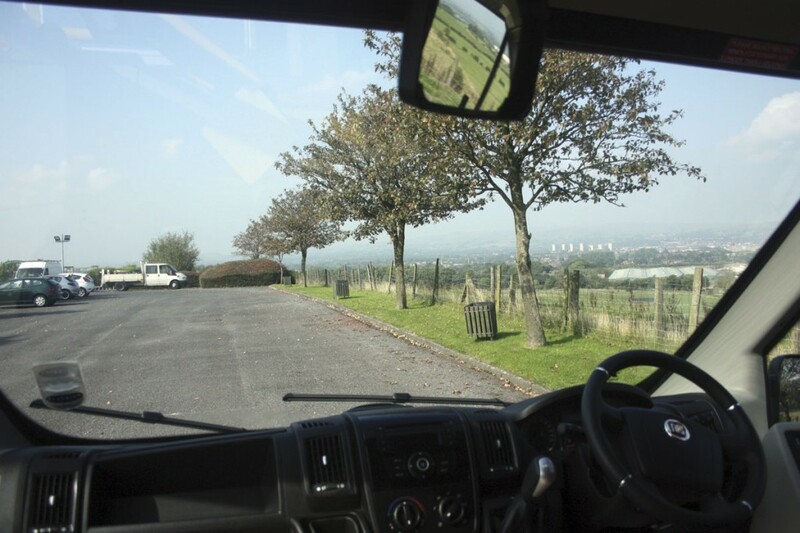 So what do Mellor intend to do with the former Bluebird range? That is simple – build it and develop it. Mellor already had its own low floor vehicle developed using a Fiat Ducato front end married to a low line AL-KO chassis. It is a perfectly good vehicle but lacks the true low floor accessibility and the innovation of the Bluebird designs. Apart from Lancashire County Council, for whom it is a frontline vehicle, it has never been a best seller. 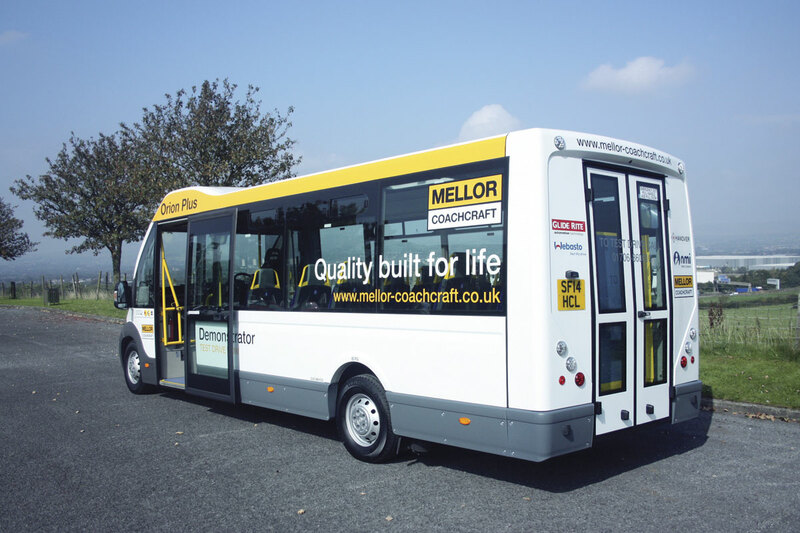 Mellor will continue to offer their own vehicle for the foreseeable future because there are customers and circumstances where it is more suitable than the Bluebird derived offerings. But alongside it they will also market the former Bluebird range of Tucana, Orion and Orion Plus, with further developments of those vehicles already underway. Added to that, and of great importance, is that Mellor will be supporting the near 1,000 Bluebird vehicles already operating in the UK as far as possible in the circumstances. They are already well advanced in integrating the Bluebird parts list into their systems and have contacted all existing operators giving them reassurance that continued support is available. As I said earlier the Bluebird team of designers, engineers and production specialists were a top notch team and the Bluebird products were and are revolutionary in their use of new lightweight materials and design solutions. Today many of these materials and techniques are common in our industry but that wasn’t the case when Bluebird began to use them. The team were always striving to keep one-step ahead of the competition and researching new and better ways of doing things. They not only built really good looking vehicles, they did the job for which they were designed well, as the hundreds in service stand testament. All of that expertise could have been lost but it hasn’t been. Brian Davidson is far too astute for that. Many of you may not realise that there was another side to the Bluebird business – Bluebird Engineering Solutions. It still exists and Rob Miller continues to run it from its Scarborough base. It is primarily engaged on producing large component parts for the ADL bus range which is built at Scarborough. Through this it was able to re-employ many of the former Bluebird Vehicles shop floor workers made redundant by the closure of that company. The key design, engineering and production systems team including the redoubtable John Randeson, the former Production Manager, has been absorbed into the Mellor team. Most will remain based at Scarborough and handle development of the range as well as providing services to the rest of the Woodall Nicolson companies. Others, including John, are already helping the Rochdale team integrate production. All of the jigs for the production of the Tucana and Orion have been retained. The quality of the production techniques at Bluebird is something that always impressed me. Right from the start the company’s intention was to use the highest quality systems to ensure consistency in the vehicle build. Geoff Hudson, Managing Director of Woodall Nicholson told me that when he and the Mellor team first went to Scarborough they too were highly impressed with this aspect of the vehicles, together with the soundness of the base engineering. These are aspects they are keen to maintain. If you have visited Mellor’s facility in Rochdale in the past will know that it was not an ideal production facility. Operating on a very cramped site, it had a main production facility which had been adapted and modified many times over the years to deal with changes in vehicles and demand and producing a range of vehicles of widely differing style and complexity. It was also already running at near full capacity so slotting new additional products into that situation was never going to be easy. Not surprisingly, addressing Rochdale’s production was one of Brian Davidson’s first moves when he joined the company. His reputation for sorting out production facilities is legendary, most notably his radical reorganisations at Plaxtons and also the Dennis facility in Guildford. Ideally he would have looked to expand the facility but that was not an option at that stage. What he did was to carry out serious surgery on the Rochdale building, removing walls and making other structural changes to allow it be transformed into a clear production space. Into that he is in the process of establishing clear production lines which will operate on flow line principles using the now common lean manufacturing concept of having all parts for a vehicle in position beside the track just in time to meet its production schedule. This work is currently still in progress and the number of responsibilities for each line have not been completely finalised. It is likely to end up with three clear lines, two devoted to main stream products and one able to cope with specials which have always been a feature of the Mellor product offering – vehicles like mobile libraries for example. Simply lifting the Orion and Tucana production requirements and plonking them into the Rochdale facility would have been difficult so they have opted for a compromise solution. For the foreseeable future the base build will remain at Scarborough using the existing jigs and systems and perhaps more importantly the highly skilled staff. They are not employed by Mellor but by Bluebird Engineering Solutions who will act as a sub-contractor to Mellor in much the same way as it already is to Plaxton. They will be responsible for carrying out the necessary conversions of the front end units which currently come from Fiat and VW, attaching those to the unique Bluebird chassis and then framing the vehicle. The vehicles will then be transported down to Rochdale where the rest of the build will be completed. ‘It’s using the best of your available skills in the most effective way,’ said Geoff Hudson, ‘the chaps at Scarborough are brilliant at building the base vehicles whilst the teams at Rochdale are brilliant at taking a shell and turning it into a completed, high quality minibus. It was vital that we kept the gap between the end of Bluebird Vehicles and the emergence of the Mellor built product as short as possible and this is the best way to achieve that.’ They have moved fast because already Orions are being built at Rochdale and production will ramp up in the coming months. Tucana will also be built this way, starting shortly. Development of the product is also well underway with teams working to develop out base weaknesses in the designs, which fortunately are very few, but also develop new products. 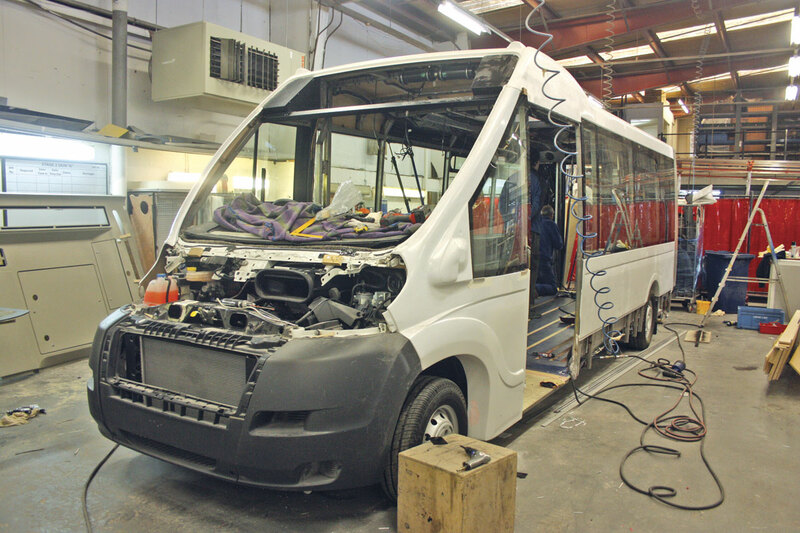 The first of those will appear as early as the up-coming Euro Bus Expo in Birmingham in November, others, like the electric version and the stalled 35 seater Pegasus project, are now also back in the frame whilst on the Mellor side development of a replacement for the Vario is also well advanced. Over recent years Bluebird had been steadily moving to a situation where it manufactured much of the componentry for the vehicles itself most notably seating, glazing, handrails and some internal trim. These were made down in Derbyshire by Advanced Vehicles a separate company that formed part of the Bluebird Group. That company was made a totally separate unit at the back end of 2013 and is now run by Gary Robinson. It will continue to supply Mellor with componentry for the Orion and Tucana for the foreseeable future. The designs and intellectual property rights of these components remain in Mellor ownership, Advanced will simply act as a a sub-contractor. Whether Mellor will choose to continue to follow the philosophy of in-house component production remains to be seen. My gut feeling is that they will decide to source from a range of suppliers in the longer term. Mellor are keen to develop the service bus potential for the Orion/Orion Plus but recognising that this was a sector of the market in which they have no experience they have decided to retain the services of Rob Millar as Business Development Manager and he will concentrate on sales into that sector and also development of the overseas potential for the products, something he was already well advanced with, particularly in Australia and Canada, both of which are seen as big potential markets. There is already an Orion operating in Australia and it has been very well received. The Mellor sales team of Alison Prince and Steve Haywood will concentrate on the local authority and community transport sectors. There are currently three products in the new range: the Mellor Tucana, the Mellor Orion and the Mellor Orion Plus. All vehicles follow the same basic concept of a front wheel drive front end unit produced by one of the main stream manufacturers. The Tucana uses the VW T5 front end whilst the Orions use the Fiat Ducato Maxi unit. 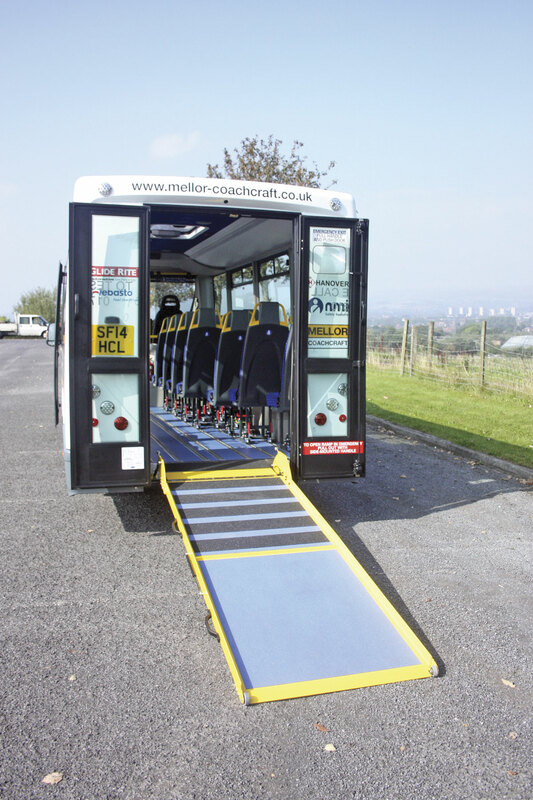 All vehicles provide a low floor entry and a wide front entrance, making it easy for a wheelchair passenger to access the vehicle unaided via a manual ramp. Once inside the vehicle the floor remains entirely flat throughout. All models are available in two forms either as conventional accessible vehicles with rear doors and a fold out ramp enabling wheelchairs to be pushed into the vehicle (these vehicles also retain the side door wheelchair access), or in service bus form where the vehicle does not have doors or a ramp at the rear. The front unit consists of the engine, transmission, front axle, suspension and drive units together with the full cab and driver’s seat. The first stage is to remove and discard the cab cladding unit ready to receive the stylish moulded GRP front ends which are such a feature of the Tucana and Orion and separating the cab unit from the Fiat chassis which apart from the rear axles, wheels etc is discarded. The front end is then married to their own unique low line chassis which incorporates trailing link suspended Fiat Ducato wheels and braking systems. Suspension can be either via two air bags or coil springs. 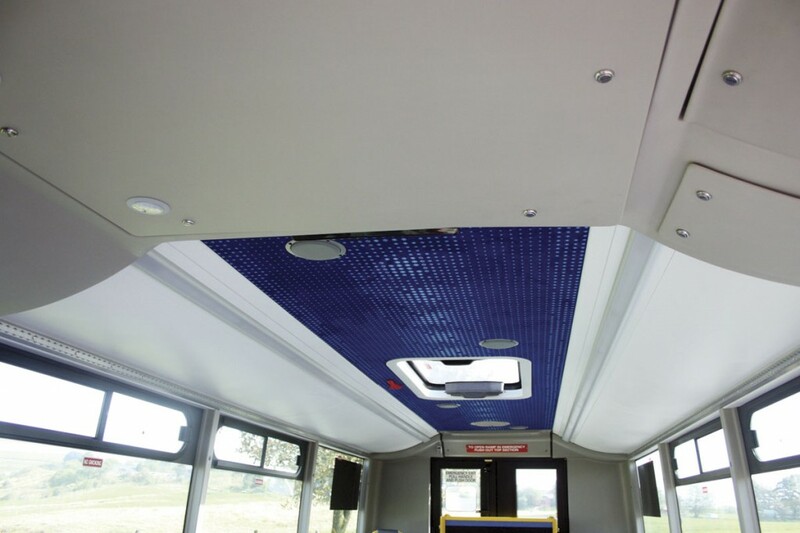 For vehicles which will have rear wheelchair entry in addition to side entry it is usual to fit air suspension to enable a very low angle to be achieved for the wheelchair ramp. For service bus operation, where there is no requirement to lower the rear end of the vehicle, it is more common to use the coil spring arrangement. The vehicle body is then framed using conventional techniques of jig assembled welded, square section, steel tubing. The whole structure is extensively corrosion protected and meets all the latest EU regulations on structure strength. The Tucana can provide a seating capacity of 15 or up to three wheelchairs. 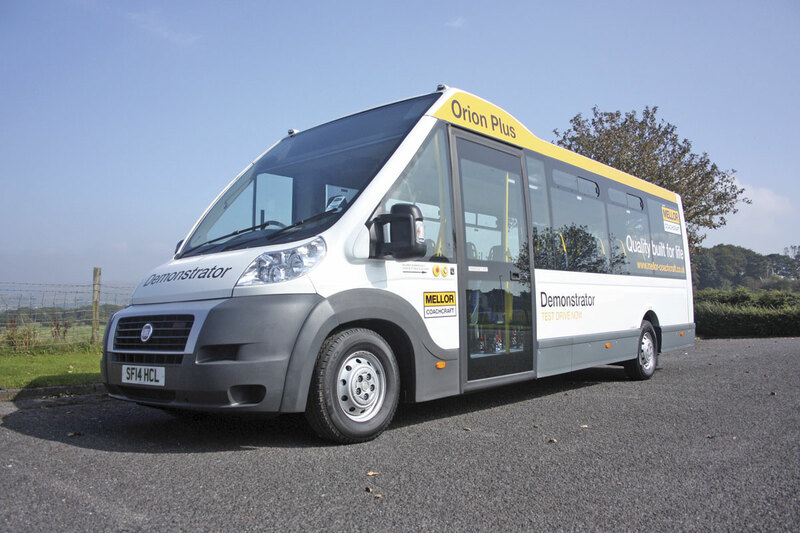 The Orion can seat 16 or four wheelchairs whilst the Orion Plus can seat up to 20 or carry up to five wheelchairs in community transport form, or 22 seats and one wheelchair in service bus form. In service bus form the wheelchair bay is in the conventional position behind the driver and with the wheelchair passenger facing backward. In this location anchorage for the wheelchair is not required but a special seat belt is fitted. The Mellor Orion is 7.422m long whilst the Orion Plus is 7.772m long. Both vehicles have an overall width of 2.2m and an overall height of 2.635m. Gross weight is five tonnes with 2.1 tonnes on the front axle and 2.9 tonnes on the rear. The engine is the Fiat (actually Iveco) 3.0litre four-cylinder turbocharged, intercooled fuel injected diesel unit to Euro6 emission standards. It produces 157bhp at 3500rpm and develops a maximum torque of 400Nm across a wide speed range. The standard transmission is the Fiat (actually ZF) six-speed semi-automatic unit which provides two-pedal clutchless control. The alternative transmission is the Fiat (Iveco) six-speed synchromesh unit. The drive is transmitted to the front wheels. Front suspension is fully independent with air as an option. Rear suspension as explained previously can be either air or coil springs depending on the intended use of the vehicle. Steering is power assisted. Wheels are standard Fiat units wheel shod with 225 65 R16 tyres. Braking system is again the Fiat hydraulic split system. The body structure as previously described is a welded steel structure heavily insulated and clad in GRP moulded panelling which gives the vehicle its distinctive lines. Glazing employs large, bonded, tinted units. The front entrance is fitted with a manual ramp as standard. The door is a one piece Ventura rapid action, plug unit that opens parallel to the body side. Where fitted, rear doors are two piece, side hinged, glazed units that also act as emergency exits. A rear inboard fold out ramp providing a very shallow ramp angle is standard. On service bus derivatives an offside rear emergency door is provided. The interior is clad in moulded GRP units. Lighting uses LED units with a night driving facility. Other features are a glazed roof hatch which doubles as an emergency exit, convection heating and air conditioning. Seating is currently Advanced fully belted units which can be supplied in double, single or tip and fold styles depending on required layout. Seats can be either fixed or track mounted with quick release fixings. 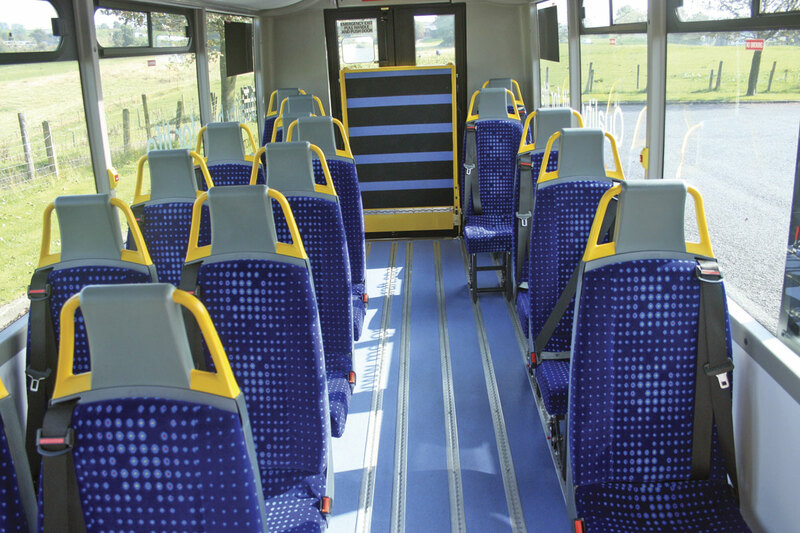 I expect the choice of seating types, track styles and seat fixings to be one of the first areas that Mellor modifies. Other units of importance are the generous well designed hand rail systems which again can be tailored to suit customer requirements. The cab is basically a standard Fiat Ducato unit fitted into the Orion’s styled front end which incorporates provision for a destination unit if required. The space where the front passenger seat would have been can be fitted with a luggage pen if required. 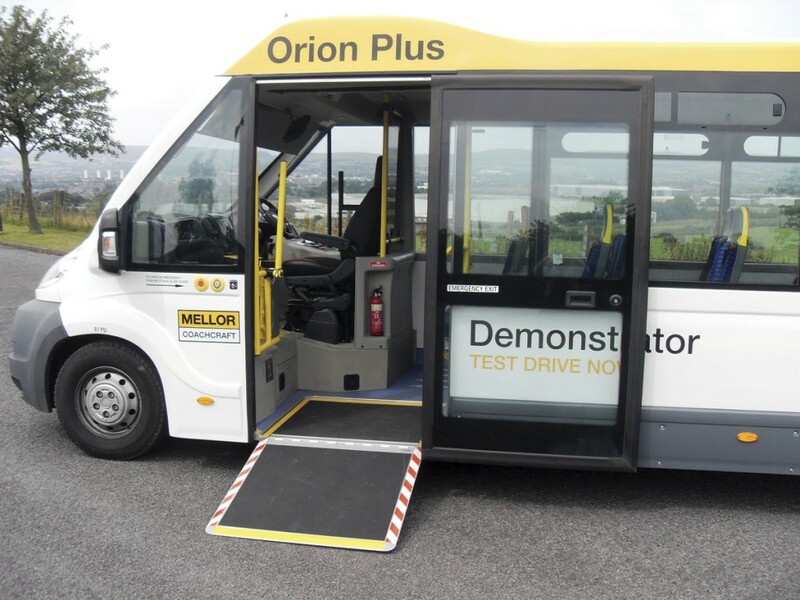 I took the opportunity to drive the first Mellor built Orion Plus. Inevitably, having been built from existing componentry it still carried plenty of references to Bluebird especially the glazing. I make no bones about saying I am an Orion fan. Right from the first time I drove the prototype many years ago I thought it was an outstanding vehicle and the arrival of the larger Orion Plus reinforced that view. The first thing that strikes you is its style and presence; these are unashamedly very good looking vehicles, as far removed from the image of a ‘social services vehicle’ as it is possible to be. That feeling is carried through when you board through the wide entrance with minimal step. Even without the ramp extended the step height of the only step is just 310mm without air suspension or 250mm with it.. Inside, you notice how light and airy it feels and the flat floor throughout the saloon area. The vehicle I inspected was built to the local authority/ community transport style so it had track mounted seating, a mix of singles and doubles, with tip and turn units at the rear to create wheelchair space. 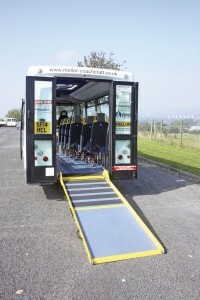 Other features included wheelchair clamp storage and additional lighting for loading wheelchairs at night. The two large rear doors opened fully, securing back to the rear of the vehicle. The ramp is a lightweight, fold out unit which can be deployed easily by one person with little effort. Even without using the lowering suspension facility that this vehicle had, the ramp angle is shallow; with it deployed it is very shallow. With the suspension lowered the rear step height is a mere 385mm, giving a ramp angle of 8.85 degrees (using a 2.5m ramp); without air suspension the height is 445mm giving a ramp angle of 10.25mm (again using a 2.5m ramp). 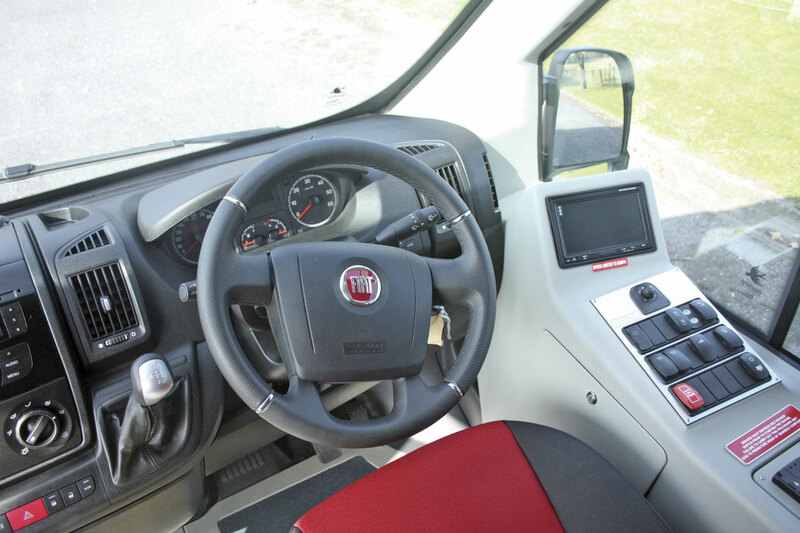 The cab is, as I have said, basically Fiat Ducato and there is nothing wrong with that. It is well laid out with all controls and instruments falling easily to hand or in perfect line of sight. The seat is fully adjustable enabling an ideal driving position to be selected, even for short legged people like me. Because the vehicle does not have a driver’s door, access being from inside the vehicle, the area alongside the driver, where the door would have been is fitted, incorporates a well designed moulded unit which accommodates the body system controls, the reversing camera screen and lockable storage for the driver. The excellent heated rear view mirrors are fully adjustable from the driving seat. The massive Orion screen gives excellent forward vision. It is fitted with two electrically operated full width sunblinds which run on guides. The driver also benefits from a separate heating and air conditioning system. When you start it up you are immediately aware of how quiet it is, thanks to the extensive sound proofing built into the cab trimming. One aspect of the Orion and Orion Plus which has not proved universally popular is the semi-automatic transmission. I have never really understood that because I think it is an absolute dream to drive just as its bigger brothers, ZF’s AS-Tronic, Volvo’s I-Shift and Scania’s Opticruise are. It isn’t a fully automatic so I’m sorry it won’t change like one and no amount of effort from the driver will make it. However, if you let it do its own thing, it will change beautifully and you can get very close to the same performance as a fully automatic. If you try to force it to change quicker, it will resist and I think this is where many people have got caught out. I took the Orion Plus out onto Rochdale’s crowded urban streets. It was as I have always found, excellent to drive. The superb vision through the screen, the excellent rear view mirrors and the positive power steering mean the vehicle goes precisely where you want it. As I have said, if you don’t try to force the transmission, it will quietly go about its business making up and down changes that are barely perceptible. Braking was equally smooth and assured, ride, as I expected, was excellent and the quality of build meant there were no shakes, rattles or squeaks. Having cleared Rochdale’s urban sprawl with its massed ranks of mini roundabouts and traffic lights we headed for the hills and this is where you really get a feel for the performance. The power unit delivers bags of usable power and the considerable torque back up means even the steepest climbs can be tackled easily. In these situations the handling and ride remained faultless. This vehicle is as it has always been, a joy to drive. I returned to Mellor’s Rochdale factory confident that despite new ownership this excellent vehicle is in very safe hands. Hands that will see the product go on to achieve greater things. 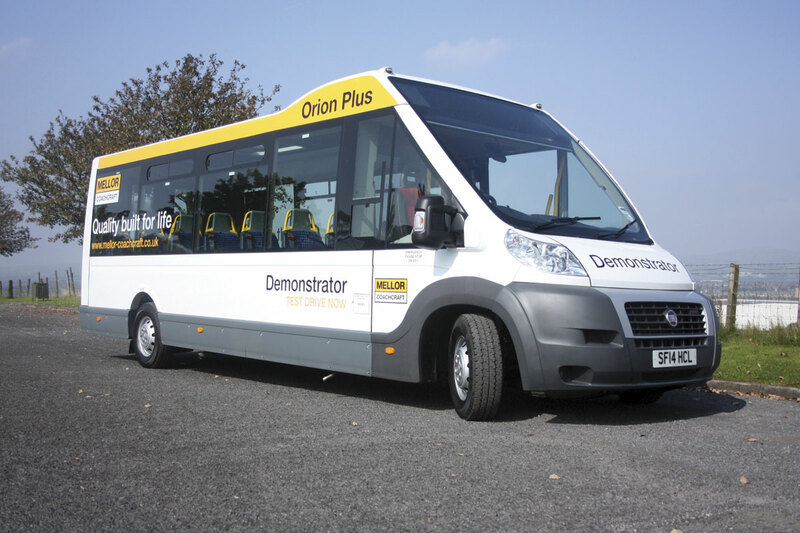 If you are going to Euro Bus Expo you will see, because Mellor will be launching the latest Orion development, the Orion Lite. This is a specially developed version of the 16 seat Orion designed to have an overall GVW of 4250kg. This means that community transport type operators can operate the vehicle on a Section 19 permit using volunteer, unpaid drivers without the requirement for them to possess a D1 licence. Provided they are between 21 and 70 years of age and have held a driving licence for two years they can drive the vehicle with passengers using the B category on their driving licence (A category for those who held their licence before 1990). Mellor have achieved the decrease in GVW without basically changing the Orion. The only changes have been to use the smaller and lighter 130bhp 2.3-litre diesel engine and to fit the vehicle with 16 Rescroft CT-Lite seats. All the other features of the Orion are retained unchanged. It will I think prove very popular with its target market where the complications over volunteer drivers not having a D1 classification have proved to be a difficult and costly problem to overcome. I am immensely impressed with the way that Mellor have embraced the former Bluebird vehicle range. There could have been hostility to bringing a formerly competing product into a long established business but quite the reverse, the Mellor team seem to have taken to the Orion, Orion Plus, Tucana and now Orion Lite with enthusiasm. The careful integration of key members of the former Bluebird team like John Randelson, the retention of the skills at Scarborough both in terms of the design and engineering departments together with outsourcing the base construction of the vehicle to Bluebird Engineering Solutions’ experienced team are inspired decisions which I am sure will pay handsome dividends in the future. These are products that were too vital for the market to lose and Brian Davidson and his team are to be congratulated on the speed with which they moved to secure their future and the steps they have taken to have them back in production as quickly as possible.